Entrances provide the first impression of a building and artworks have been commissioned to greet staff, patients and visitors as they enter. In the main entrance café you can see 'Old New Borrowed Blue' by Robert Dawson, a blue and white ceramic tiled mural of a reworking of the most famous design in the history of ceramics - the willow pattern plate. 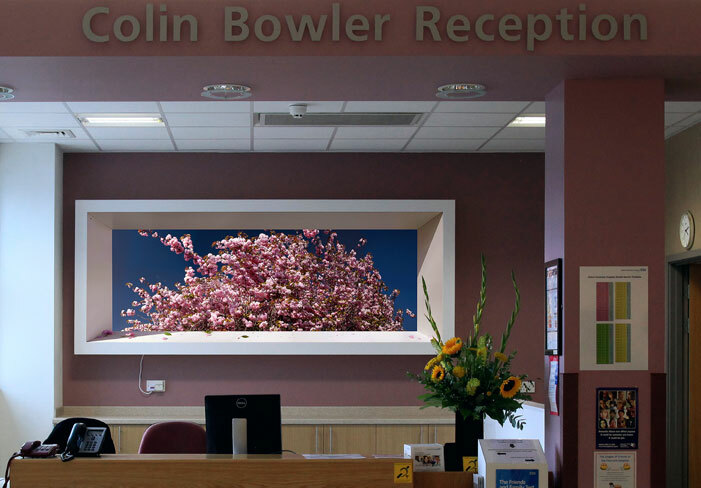 Artists Heinrich and Palmer have designed this trompe l'oeil lightbox for the reception desk to greet patients and visitors and create the illusion of space. The work is entitled Sakura, the Japanese for cherry blossom. Decorative wallpaper and a beautiful back-lit glass panel has transformed this small room into a more comfortable and attractive space for contemplation, quiet thought and prayer. The artist, Sasha Ward, also designed the wall panels to welcome visitors to the room, developed the colour scheme and selected furniture for the space. As you walk further into the building, 'Water falls', a glass sculpture by Andrew Moor and Harry Cardross, dominates the main staircase. The overall concept of a glass waterfall and river that would greet visitors originated with the building's architects, SBA; the artists were then commissioned to interpret this idea. Tanja Entwistle's brilliantly coloured 'Ginkgo Leaves' lead you up to the first floor. 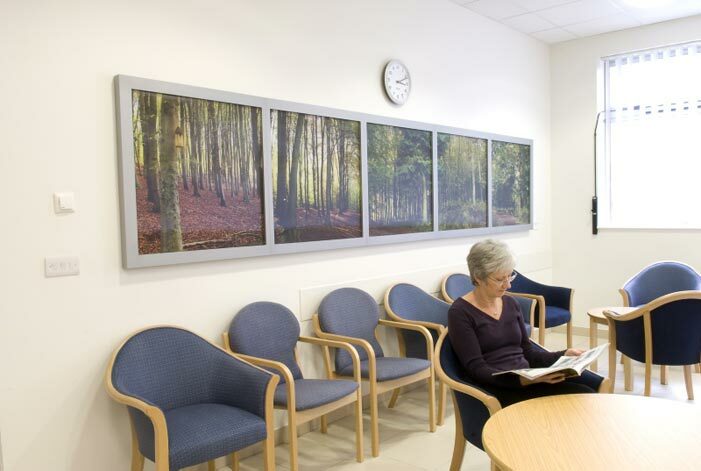 Liz Rideal's 'Hawthorn Hall of Mirrors (454308E - 20569ON)' at the Cancer Centre entrance is a sandblasted and acid etched mirror, creating light and colour through the changing reflections of those walking past. The pattern of the mirror is derived from a photogram of branches and berries taken from an old hawthorn tree located close to the new building. The title etched into the mirror, gives the location of the hawthorn tree. Visitors to the Wytham waiting area will be able to spend time with 'Wytham Seasons (the Observed and the Observer)' by Edwina Fitzpatrick. This panorama of Wytham Woods uses lenticular technology which means the images seem to change as you move - autumn becomes spring, ferns and fungi appear, and you can see a red kite, a woodpecker, squirrel and deer in the woodland. The aim is to intrigue, generate conversation, and make time pass more quickly for those waiting.